"relevant, rebellious, raucous and entirely ravishing"
It's easy to recall school trips; sitting at the back of the bus secretly swigging Coca-Cola whilst rolling up blazer sleeves to show off your latest shag bands. But the Catholic schoolgirls of the fictitious convent school in Oban have an altogether different idea. 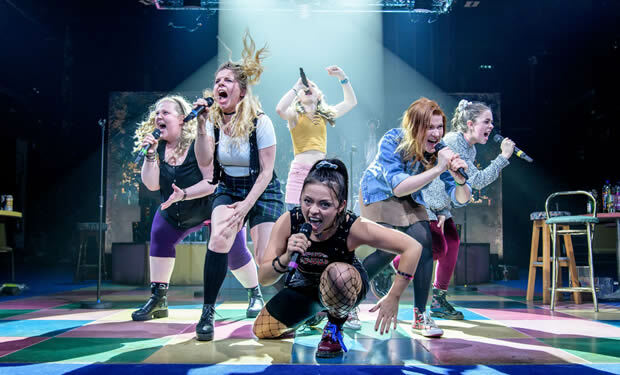 This is Our Ladies of Perpetual Succour, Lee Hall's (Billy Elliot) latest National Theatre venture that received huge acclaim at the venue, earning a transfer to the Duke of York's Theatre in the process. It's a foul-mouthed, loud, crass and crude adaptation of Alan Warner's The Sopranos, and it is simply glorious. An expert female ensemble commands the stage, featuring six girls with their own string of narrative; Chell is convinced she can see her dad in seaweed, Kay is going to university, Orla is suffering with cancer, Manda indulges in “Cleopatra baths”, Kylah is quitting her band to go solo and Fionnula is only just discovering who she is. All of the stories are punctuated with blasts of hymns and full on renditions of ELO songs, including “Mr Blue Sky”. As a premise, the plot itself is spread a little thin, but this is redeemed by Vicky Featherstone's intuitive direction and the explosive energy that expels itself from the cast. It's directed just enough to retain that urgent, bubbling “anything could happen” feeling, whilst the sentiment and depth in the dialogue is carried through with true sincerity. The girls themselves are a terrifically talented bunch, and it is more than refreshing to see a group of young girls spilling onto the stage, including a wicked all-female band. There's an electric chemistry between them, a sense of true friendship and empathy, particularly when they all sing in perfect harmony. Dawn Sievewright is wonderfully funny, yet touching, as Fionnula, whilst Frances Mayli McCann has a completely natural stage presence as the group leader. Our Ladies is quite unlike anything in the West End, and there hasn't been anything like it for a long time. Chloe Lamford's dive-bar design is perfectly sparse, opening up the floor for the actresses, whilst Lizzie Powell's lighting design illuminates the stage, casting a spotlight on this rising young talent. Of course, the play-come-musical carries an important message about gender, freedom and doing whatever the hell you want. It's a real breath of fresh, youthful air, and could not be more different to The Glass Menagerie, which was previously seen on the Duke of York's stage. It’s relevant, rebellious, raucous and entirely ravishing. In fact, it's difficult to imagine a better way to spend an evening. 22 May 2017 - "relevant, rebellious, raucous and entirely ravishing"